The success of a giveaway can be attributed to several factors, but the main contributors are: 1) the level of awesomeness of the giveaway you created, and 2) the amount and quality of marketing you did surrounding the giveaway. “I tweeted the giveaway to my followers” is not quality marketing. If you half-assed one of these then you have your answer–that’s why the giveaway bombed. Site impressions versus giveaway entrants. That’s how you can tell if the problem was with your giveaway or your marketing. Using our analytics tool or Google Analytics, you can see how much traffic your giveaway page is receiving. If you see a lot of impressions but significantly less entrants, that means the visitors came to your giveaway page, saw your offering and entry options, and decided it wasn’t worth their time. If this is the case for your giveaway, there are a few things you can review to explain your dismal results. If you featured an inexpensive prize, people probably weren’t excited to enter. If the prize was random and wasn’t something the majority of your audience could use, then it wasn’t worth the effort. Did you have too many entry options? I’ve seen giveaways with upwards of 20 entry options which can be a deterrent for people since it becomes too time consuming. Were your entry options too invasive? Some people want to keep their Twitter accounts strictly professional, so they may not enter your giveaway if your only entry option requires them to tweet. Did you use the Facebook entry option within a Facebook giveaway? If so, you may have created a weird user experience that confused the entrant so their entry was never saved. Check out our article on the Facebook entry option for more information. If your analytics tool is showing low traffic to the giveaway page, you can chalk up the poor performance to ineffective marketing. Low traffic leads to low entries. If the problem was the giveaway itself. Prize. We’ve found that $200+ prizes perform the best, but depending on your business you may not be able to swing that. In that case, you should focus on the prize/audience fit. Did you really think your all male audience would be interested in a mani/pedi spa day? Entry options. Making the barrier to entry too high or too time consuming is something that can derail your giveaway. The next time around, try keeping the number of entry options between three and six. You should also consider using simple entry options like joining a mailing list or answering a poll instead of the higher stakes entry options like tweeting a message or pinning an image. While Twitter and Pinterest are valuable entry options, you should try entry options that don’t require entrants to make announcements to their followers–especially if they’re new to your brand. If the problem was your marketing. Start early. It’s tempting to throw together a quick giveaway and hope for the best, but if you’ve bombed once, you shouldn’t risk it again. The more traffic a site has, the better a giveaway will perform, but few sites have thousands of daily visitors. It’s perfectly fine if you have a small audience, you just have to make sure every single audience member knows and is excited about your giveaway. This takes some planning. Market often. The ‘set it and forget it’ method isn’t going to work. Not only should you start your marketing campaign before the giveaway is even posted, you should continue your marketing efforts for the duration of the giveaway with social posts and possibly email updates. “24 hours left to win XYZ!” Here’s a guide on when to promote your giveaway and a post we recently wrote on giveaway promotion strategies. Market in the right channels. Email is the place to start if you have a list of subscribers. Sending out a ‘heads up’ email before the giveaway goes live will help you launch the giveaway with some momentum. People who already support you will more than likely be excited to enter your giveaway. Social media is up next. 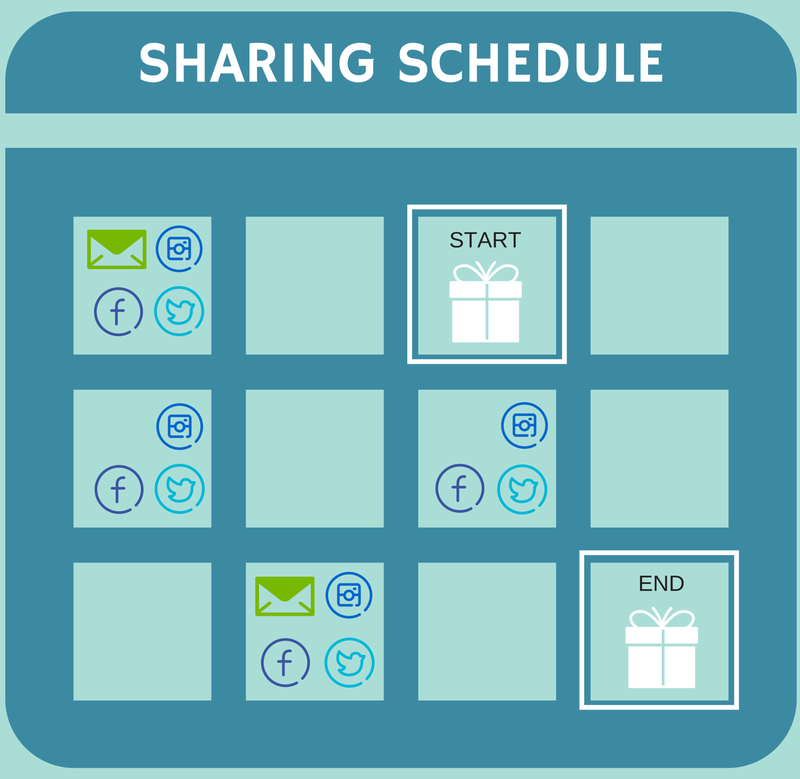 Scheduling out your social media posts ahead of time will keep you on track for effective promotion. We suggest announcing the giveaway 48 hours before it goes live, again when it goes live, and then several additional times before it ends. It’s a good idea to announce it on all of your social channels, but you’ll obviously want to pay special attention to the channel with the most followers. Here are some additional best practices on where to promote your giveaway. You can also dig a little deeper in your analytics to identify the source of the traffic you received in your previous giveaway. If most people came from your Facebook ad, then you could consider putting even more resources behind that channel next time. And lastly, if you’re reading this thinking “I don’t have any email subscribers, and I barely have any social media followers”, don’t fret! Go read this post about working with other bloggers. If you’re planning an awesome prize, other bloggers might be interested in hosting your giveaway on their site as well. That’s the easiest way to expand your reach. It’s ok if your first giveaway bombed, but it’s not ok if your second giveaway bombs. Be honest with yourself when analyzing your giveaway. If your prize sucked, try a new one. If your marketing was so-so, rethink your strategy. If you haven’t checked it out, our Ultimate Guide to Giveaway Marketing is a good place to start if you need some additional tips. Another well-written and super informative article, Brittany! You’re absolutely right that sometimes it’s the structure of the giveaway that’s the problem — it’s often a low appeal prize or high barrier to entry — and other times it’s the (lack of) marketing. It’s also a really good idea for giveaway hosts to have realistic expectations to begin with and monitor the right metrics. If you only market your giveaway to your existing audience, for example, you can’t measure success by the increase in email subscribers, Twitter followers, etc., because the people who are entering are *already* your readers/customers. It’s simple: if your goal in running a giveaway is to expand your audience, you have to go outside of your audience to advertise your giveaway. A great giveaway platform, well thought out prize and effective marketing are three essential areas that giveaway hosts should budget for. If a giveaway didn’t do well because of marketing, there are resources and services out there that make it easy for you to effectively market your giveaway so that your next one won’t bomb. Spend the time to do some research. I highly recommend your Ultimate Guide to Giveaway Marketing. It’s a must-read! Hey Bridget! Wouldn’t it be nice if every marketing campaign went viral? ;) You’re right about expanding the audience. You *have* to reach outside of your existing circle.